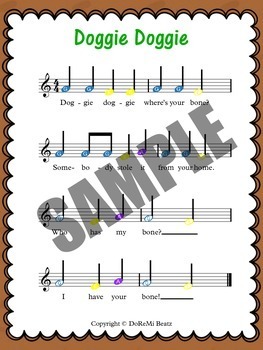 This up-beat backtrack of the well-loved traditional song game "Doggie Doggie" adds a modern rock feel to your Kodaly or Orff based music classroom. Great for large or small music groups, music listening centers, or even private lessons. This one-of-a-kind composition brings a unique sound that all grades K-6 will want to repeat again and again! 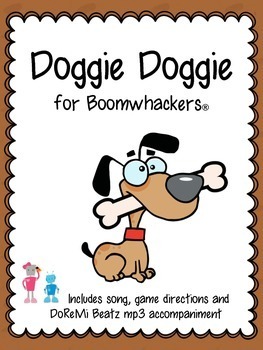 The Doggie Doggie mp3 Boomwhacker ® backtrack is written in the key of C with colored solfege syllables, so it's versatile enough to be used with Orff instruments, ukuleles, harmonicas, xylophones and more! Check my other listings for Doggie Doggie with handbells or harmonicas!